swap stands for Schools Wellbeing Activity Programme. It is our new programme for students in years 6 through 9. It provides education and skills to help students learn good habits that promote healthier wellbeing. swap has been developed from the latest academic research and covers four key areas of wellbeing: movement, nutrition, sleep and emotional wellbeing. 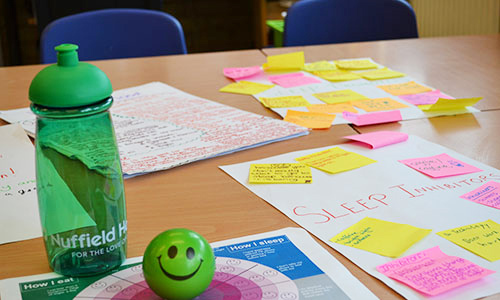 Why are we/Nuffield Health introducing the School's Wellbeing Activity Programme (swap)? Young people are growing up today in a time of massive change and experiencing significant wellbeing challenges. They don't all have the skills and behaviours to help them cope. There is a clear need to help school-aged children manage their wellbeing both inside and outside of school, acknowledged by experts and the government. From our own research of having a Head of Wellbeing we've gained lots of insights into how we can help young people. Using the findings from the Head of Wellbeing work, we developed (swap) School Wellbeing Programme, which is designed to be run by our sites with local schools. We are ideally placed to do this because we have a wealth of experts who understand how good health behaviours and habits can impact both current, and future wellbeing. What is the scale of the challenge regarding young people's wellbeing? 9 in 10 young females and 8 in 10 young males do not meet the government guidelines for physical activity. How will we measure our impact? We are aiming to ensure that every one of our sites partners with a local school by 2020. We are providing our staff with the time and resource to share their skills, expertise and our resources to improve the health and wellbeing of those taking part. We will do this through our gyms and hospitals partnering with their local schools, and offering education and activities at our clubs or on-site at the school. This will increase access to our services and provide young people with skills and knowledge to manage their own wellbeing. How will the programme help support improving the wellbeing of young people? Building on behaviour change theory, the programme will involve offering ‘meet our experts’ style drop-in events focusing on young people’s wellbeing, with 4 key themes: How I Move, How I Eat, How I Sleep and How I Feel (focusing on physical activity, sugar content of foods and drinks, hydration, fruit and vegetables, sleep hygiene, sleep and screen time, emotional wellbeing and resilience). Our research has identified these as being the areas of priority. Clubs will look to develop their relationships with local schools through reaching out to schools in their local area and inviting young people (along with parents and teachers) to attend a specific ‘swap’* event for school wellbeing. Nuffield Health staff may also visit the school to run an interactive event. We will also share with schools information, resources, guidelines and lesson plans for teachers and parents to promote engagement in these areas. Why would a school or parents want to take part? What are the benefits of taking part? As a parent or teacher, you will be able to access free expertise and information regarding a young person’s wellbeing and take away some valuable learnings and resources to support your own work with school-aged children. Young people can engage in interactive activities while you will have the opportunity to ask any questions you may have about your own wellbeing or supporting the wellbeing of those young people in your care. Sites may also offer discounted membership rates and access to their facilities. What reassurance will Nuffield Health give to staff and parents (e.g. DBS/CRB checks) to ensure the safety and wellbeing of the children? All Nuffield Health staff involved with the pilot have undergone mandatory training in key areas of expertise, including safeguarding and working with young adults, and are all DBS checked, to ensure the safety and wellbeing of the children participating in any initiatives. Appropriate sign-posting protocol will be followed should there be any disclosures or concerns that arise from our conversations with young people. However, these sessions are designed to be a ‘light-touch’ and engaging rather than heavily focused on identifying mental health issues or generating referrals. Any data collected on health behaviours will be anonymous.